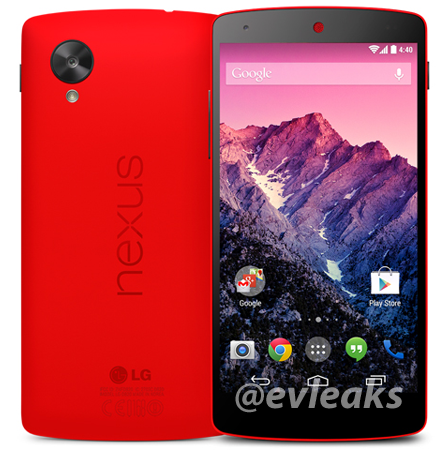 It appears that Google is planning to launch a red hot Nexus 5. Its still not confirmed officially by Google but some reliable sources @evleaks are claiming this will happen as soon as Feb 4th. The screen capture looks pretty believable and authentic. Red Nexus looks very vivid and has huge potential of success. The Nexus 5 is rumoured to be last of Google's flagship phones and Google will stop selling Nexus series phones from 2015. Don't worry Google will continue to sell Stock Android phones from Play Store like it sells Galaxy S4 etc. The selling of Motorola mobility to Linova is a clear indication that Google has no plans of getting into hardware manufacturing business. Its slightly a strange strategy if you consider Microsoft buying Nokia but Google seems to have learned that there is no point in entering the already conjuncted phone manufacturing business with too many players doing world class Innovations and Google would mostly like to focus on the software aspect of the business.